Inspiration can come from many places. I find that most often, my inspiration comes from my fellow foodies: the journalists that cover the latest trends in food, the chefs who create the amazing foods we enjoy when dining out, and as of late, David, my cheese dealer* at Surfas. David and I see each other at least once a week and always pause to talk about food. The other night he was regaling me with the story of the delicious Roquefort ice cream his co-worker Alyson recently made. I knew I had to have some. I also knew that I still had a wedge of St. Agur sitting in my fridge that David had made me try the last time I was at Surfas. It’s the creamiest blue I’ve ever tasted and while pungent, not overpowering. I knew it would be perfect for ice cream. 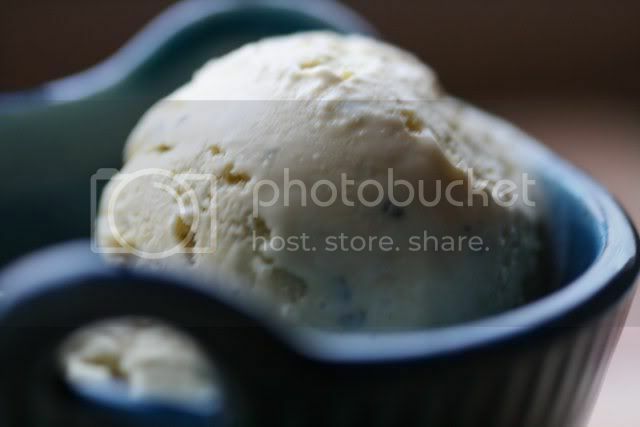 Not having worked with a lot of savory ice creams before, I turned to David Lebovitz’s The Perfect Scoop. He was the pastry chef at Chez Panisse and his book is an amazing collection of ice cream, sorbets, sherbets and mix-ins. If you have an ice cream maker, you need this book. You also can check out his blog at David Lebovitz. As I knew it would, David’s book has a recipe for Roquefort ice cream. I changed very little about the recipe aside from replacing the Roquefort with St. Agur and reducing the amount of honey. I wanted the cheese to be the star and was worried the honey would add too much sweetness. It was absolutely delicious. Not your typical ice cream by any stretch of the imagination and certainly something you would only want to serve to your more adventurous guests. I served mine with a homemade cherry compote (recipe forthcoming). The sugar in the compote adds some of the sweetness you expect from ice cream to offset the surprise you feel when tasting blue cheese. Warm the milk in a heavy-bottomed saucepan and whisk the egg yolks in a separate bowl. Slowly drizzle warmed milk into the yolks while whisking constantly to avoid cooking the yolks. Return the milk mixture to the saucepan and heat over medium-low, stirring constantly, until the custard cooks and coats the back of a spatula. Add about three ounces of the St. Agur to a medium bowl and place a mesh strainer on top. Strain the milk mixture into the bowl with the St. Agur and stir to combine. Add in honey and heavy cream and chill thoroughly. Once the mixture is chilled, stir in the remaining ounce of crumbled St. Agur and freeze according to your ice cream maker’s directions. Note: If you can’t find or don’t have St. Agur, you can use any blue you like. Though the splurge on a good-quality blue like St. Agur will definitely make a difference here. *The inference that David is somewhat like a drug dealer is not accidental. The first taste is free with David, but that’s how he gets you hooked and after that you’ll be back for more again and again. This is an interesting combination! Looks and sounds really delicious. This looks amazing, and as we are all blue cheese (and St. Augur) fans it could be worth the try! 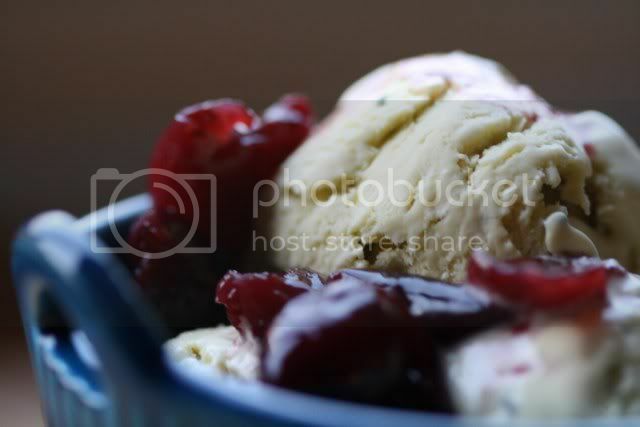 Pairing it with cherry compote sounds delicious - a real dream pairing! This sounds great. I am trying to find some St. Agur for a recipe, no luck yet! I've heard great things about Surfas, I'll have to check it out when I'm in LA next week. This sounds fabulous!! I love the photos too! captain! it's ilya. and i'm officially basing my life on your blogs teachings. but i keep on forgetting to get your email address, so i can do your thingeemebobs. Let this be a reminder... to us boths! i see you friday. and congrats on your nomination. between you and slumdog millionaire, i've really honed my 'stick with the winners' skills. haha! Congratulations on your nomination, I'm glad to discover your blog. And that has got to be the richest ice cream I've ever seen! Looks amazing. I've tried queso fresco ice cream before, but I think it was made with milk, not cream. Did you pass out after eating this? On a side note, I order cheese for a wine bar and Roquefort and St. Agur are two cheeses that are a no-brainer for wine pairing. Even reds. They're miracle cheeses. Sounds fantastic! I bet it would be good with caramelized apples or pears, too - tarte tatin, anyone? I'm fascinated. I've made savoury granitas before, but never an ice cream. I have a wedge of Ewe's Blue (which is fantastic by the way) sitting in the fridge, so this may be my weekend project. I have all these ingredients as we "speak". I may just have to make this.